Litigation is pretty much a winner-take-all proposition. Either the plaintiff wins or the defendant wins. Of course the plaintiff may win less than hoped for, and the defendant may lose more than anticipated. When John Mecklenburg opened the San Diego Division of John Laing Homes, his goal was simple: build a strong, satisfied team of employees and secure a reputation for quality, responsible homebuilding. Capital Real Estate Investments Inc. is the premier firm in San Diego that specializes solely in the acquisition, disposition and tax deferred exchanges of retail properties and shopping centers. Grubb & Ellis/BRE Commercial is heading into 2005 stronger than ever as a result of great achievements by its talented group of brokers and staff and a successful affiliation with national real estate powerhouse Grubb & Ellis. On March 1, the affiliation of BRE Commercial, the largest broker-owned commercial real estate brokerage firm in San Diego County, with the Grubb & Ellis Co. created overnight a Pacific Southwest powerhouse: Grubb & Ellis|BRE Commercial. At the law firm of Sullivan Wertz McDade and Wallace there is an interesting trio of attorneys whose combined skills give clients virtually all of the real estate law services they need. The trio is talented, committed to their clients, passionate about their work, and they are all women: Sandra Brower, Kathleen McKee and Rebecca Michael. A complete analysis of a company's risk management and insurance program is critical to a successful merger or acquisition. Risk management analysis involves evaluating a company's entire operation to determine exposures to loss. The objective is to understand the firm's risk profile and avoid assuming unknown and potentially costly exposures. Over the last two years, cap rates -- the projections of the return or yield the buyer should expect for the first full year if a commercial real estate property was purchased entirely for cash -- have fallen significantly for both office and industrial/R&D properties in the San Diego region. Traditionally, "hot spot," "transformation" and "rejuvenation" were not words typically associated with the Central San Diego commercial real estate market -- particularly not to the Kearny Mesa and Sorrento Mesa submarkets. Many 29-year-olds wince at their oncoming 30th birthdays, but brokers at GVA IPC, one of the oldest locally owned commercial brokerage firms in San Diego County, proudly embrace their 30th year with the arrival of 2005. They see the firm's 30th year as an opportunity to celebrate its longevity, its people and its success -- as it has done since 1975. The North San Diego County Association of Realtors recently held its 10th Annual Installation of Officers and Directors & Holiday Ball at the Center for the Arts in Escondido. The décor of the arts center was transformed into a movie backdrop inspired by the musical "Chicago," which was the theme of the evening. With the June 11 launch of the North San Diego County Association of Realtors Commercial Investments Division, the association has now officially launched a new online venture for its commercial practitioners. Commercial development in the San Diego region is taking new shapes -- changing with both the population and the landscape. For its largest and most ambitious village to date, The Otay Ranch Co. is looking to one of California's most beloved communities for design inspiration. Imperial County is coming on strong as the next housing growth area in Southern California. It is poised to experience tremendous commercial and residential growth over the next 10 years. Although the size of the market is relatively small at historically about 1,000 housing units per year, several economic factors, as well as pricing well below San Diego County and Indio, should result in significant increase in housing demand in the Imperial Valley in the next decade. 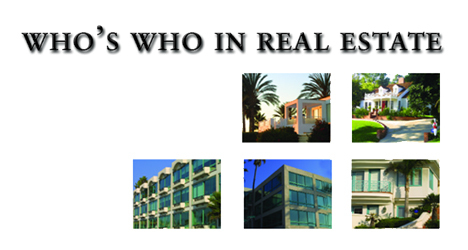 CB Richard Ellis is the top-ranking commercial real estate brokerage firm for gross sales in San Diego. The firm operates out of offices in North County, Golden Triangle and downtown. "Recycle" is not just a buzzword for the developers of Del Sur -- it's a mandate. Some people love their Starbucks coffee. Others will only drive a Mercedes Benz. Then there's Nina Sgveglia. Since building its first neighborhood of just 20 homes in La Mesa in 1984, Hallmark Communities has become one of the fastest growing home builders in the United States with over 1,000 San Diego County families now residing in a Hallmark-built home. Otay Ranch's enviable success among homebuyers and its growing reputation among land planners are directly tied to the broad experience and all-out commitment of the three executive vice presidents who are at the helm. The Otay Ranch Co.'s senior management team consists of Kent Aden, Rob Cameron and Kim Kilkenny. It has been another banner year for the global commercial real estate leader, Colliers International, due in large part to the efforts of local investment properties specialist Savvas Marinos. In what appears to be a trend, three of the largest locally based commercial brokerage firms have recently affiliated with national organizations to broaden their reach. Next year in San Diego County, luxury will be defined as a place where people want to live and experience life to the fullest, according to local real estate professionals. Large banks that provide packaged real estate services could drive Realtors out of business, both locally and nationwide, according to those working in the industry. Realtor associations cite anti-competition laws. Bank industry officials say real estate associations have the monopoly. California Realtors will have the opportunity to subscribe to a service to conduct entire real estate transactions, most likely in the first half of next year. It appears San Diego County's ever-changing retail and multifamily markets could remain in flux for a very long time, according to observers. New C.A.R. forms mostly redundant for local real estate professionals but add an extra legal blanket of security. San Diego County's residential real estate market continues to be strong, with no drastic downturn on the horizon, according to local industry experts. Real estate licensing: Should the bar be raised? Some local brokers would like to see the state's new department of real estate commissioner raise the bar for agents obtaining licenses.